Insomniacs everywhere find their way into the late-night cable world of horror movies. The plotlines are formulaic: a susceptible host and deadly pathogen meet in an impossible, perfectly conducive moment when the pathogen strengthens and spreads like wildfire from hell, to the end of life as we know it. There is, admittedly, comfort in knowing that boxwood blight is not likely to end the world, but its spread has certainly put Central Virginia’s stately and beloved English boxwood in mortal danger, with real financial consequences for property owners who face this plight. Negotiating the response to blight—whether through treatment, mitigation, or ultimate removal of decades-old plantings, can feel like a living horror film, in real time. History reminds us that plant epidemics are anything but new. Virulent outbreaks like Dutch Elm Disease, Sudden Oak Death and the Great Irish Potato Famine have wreaked havoc on societies for centuries. As the old saying goes, “science happens;” just as in human and other animal species, plant disease springs and spreads from pathogens including bacteria, viruses, fungi and parasites. Blight spreads endlessly, via yard crews, car tires, bicycle wheels—really, anything that has contacted the infected plant, including dead leaves. Robert Saunders, of Saunders Brothers, located near Roseland—about 30 miles north of Lynchburg—reports that, so far, blight has not made it into Amherst County. In order to reduce the chance of blight reaching their farm, the company will no longer hold its popular, semiannual boxwood sales. He reports that varieties including ‘Green Beauty,’ ‘Winter Gem,’ and ‘Insularis Mana’ are proving more tolerant, but adds, “Tolerance is the new buzzword. Not resistance.” For gardeners who insist on boxwood in their landscaping, Saunders suggests visiting local garden centers and requesting Saunders Brothers’ boxwood; local outlets that carry the family brand include Rain Frost Nursery and Virginia Garden Supply. Pachysandra and sweet box are also carriers and should be avoided as well. “Any of your boxwood not affected? All boxwood can get it,” Camm adds. When contemplating re-landscaping, he cautions not to plant boxwood where blight has been; it will certainly be infected again, since blight spores are viable for 40 weeks. Spray with a fungicide 24–48 hours before removal. Pick a sunny, dry day for removal. n Ensure that tools have been sanitized before, during and after removal. If possible, cellophane wrap your boxwood to reduce its size and sever the base at the soil. If it is too large, remove manageable chunks and place on a tarp or into bags. Once the boxwood is removed, rake all the small boxwood leaves that have fallen and bag. 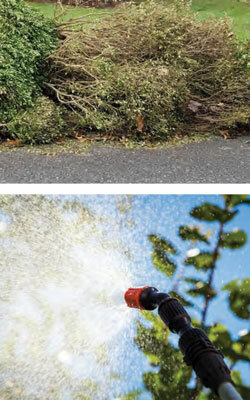 A blowtorch can be used to burn off leaf debris from the area. Mulch the area to bury any remaining leaves. The general consensus is that Lysol is a real weapon in the fight: “We use spray Lysol to sanitize shoes and tools,” says Camm. “We use it like candy and I keep it in my truck.” The disinfectant has been a help in England, where the blight has been raging for years. “We are learning a lot from the British,” he adds. At a recent meeting of the American Boxwood Association, the Lynchburg outbreak was much discussed. The easiest, but hardly the cheapest, way to remove infected boxwood from your landscape is to have a professional landscaper handle it. Landscapers who understand blight take proper precautions, wear Tyvek suits, diligently sanitize equipment and properly dispose of blighted plants. When interviewing a blight remediation professional, discuss in detail the plan for obliterating blight on your property.